Parque Kennedy in the Miraflores district of Lima, Peru is also known as the Cat Park of Lima because it is home to over 100 stray cats. Read our post to get to know the history of the park and how these cats are cared for daily. 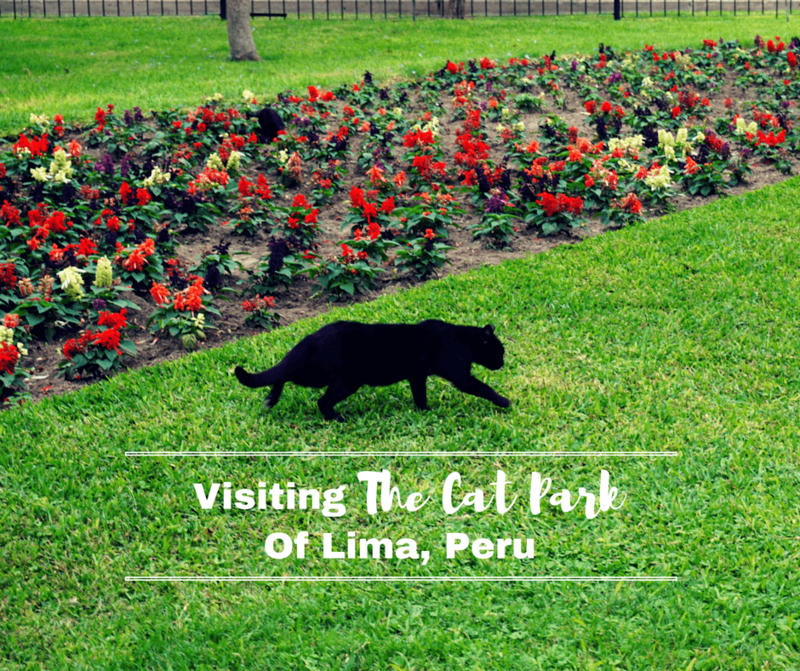 While exploring Lima, Peru we were a bit surprised to come upon a cat park. We’d never seen one before, but this park clearly belonged to the cats that could be seen all over the grounds. They were everywhere! In the bushes, on the grass, up in trees, and on park benches. And it was obvious that they were used to people as they leisurely walked passed or looked up lazily from where they were napping. Apparently, cats have called Kennedy Park home for over 20 years. Rumor has it that the original cats were left there by priests of a nearby church in order to help control a plague. But no one knows for sure. Over the years, however, they multiplied and the community began caring for them. Unfortunately, people also began to abandon their pet cats there under the assumption that the deserted cats would also be cared for. With so many cats, the park began to be referred to as “El Parque de los Gatos” or, the cat park. I was told by a local that some people do not like the cats being in the park. They think it is unsanitary and an irritation to have so many cats there. Others feel the opposite. For example, there are many local residents that are not allowed pets in their apartments so they enjoy going to the park to find temporary animal companionship. I was initially hesitant to touch any of the cats. But as we got closer, the cats looked very well fed and taken care of. It turns out that there is a group called Grupo Voluntario de Defensa Felina, or Feline Protection Volunteer Group, that feeds the cats daily and periodically provides basic veterinary services such as deworming, vaccinating, spaying, and neutering. On the weekends, they also set up a booth at the park to assist in adoptions. The park itself is also well cared for. All of the grass and bushes were neatly trimmed, the trash bins weren’t overflowing, the park benches were pristine, and there was no garbage lying around on the floor. I was also pleasantly surprised that it didn’t smell like over 100 cats were around. Whether the park remains cat-friendly will remain to be seen. One thing was for sure though; everyone at the park was obviously enjoying their time with the cats. We saw people cuddling with cats and petting them as they chatted with friends or read books. I’m not a cat person, but it sounds like an interesting park. Its good that the Grupo Voluntario de Defensa Felina takes good care of the strays. The grounds are pretty, with the colorful flower beds. Hola! Cool post 🙂 I used to play at this park as a kid and also hangout there as a teenager, where the “hippies” as we called them sold their hand-made jewelry. I don’t remember cats then, but have definitely seen them in the past few years. I didn’t know about the volunteer group. They are sooooo many cats!! There are!! Hopefully they continue to get adopted. Vicky, this park freaked my the hell out! We have an advert it the UK for a milk company and the cats can click there fingers jazz style. I kept thinking these cats were going to do that. Bahaha! If I found cats that did that, I’d be rich!! I had no idea there was a place like this in Peru! How cool. I’m more of a dog person, but the park looks very well cared for and the cats seem to be loving it! Thanks for teaching me something new today! Hi Bobbi! I am too. My boyfriend was loving it though. Haha! Trust me Katja, I was a little thrown off too, especially since I’m more of a dog person. Whoaaa! This is awesome. I love cats so will definitely check this out. Heading to SA by next year! The cats deserve a good place to live too but I’m not sure about a cat park. It’s a little strange. Poor guys. At least they have somewhere to go. Hi Laura, hopefully more people continue to adopt and give them a better home. Even though they looked pretty happy where they were lol! There was a great coffee place on the corner too. Lots to see and do in that area of Lima! Sounds like really meaningful project! I wish there was something like that in my city. If you make it possible for people to help, they will! I agree Veronika. From what I read about the volunteer group, the have helped over 300 cats get adopted. I have shared this with several friends. I think they need to visit this park. It reminds me of the Hemmingway house in Key West. That’s so true Jennifer! I’d forgotten about that. Cats everywhere! This is so cool! I would visit Cat Park! On a university campus in Victoria, Canada there is a HUGE rabbit population! It’s cool to see them hopping around everywhere! Oh! I’d love to see the rabbits one day! As a cat lover I would totally dig this! And, it’s so great that there is a group that helps take care of them, which makes it even better to go to the park for some kitty cuddles. What a fun find! I agree with Lara. I, too, am a cat lover, and get super excited when I see cats in a place I am visiting. I think it’s really cool that Lima has a cat park and is caring for these adorable creatures. Next time I visit Lima, I shall look it up!